This morning the Back bay Neighborhood Association held its Mayor Forum in an appropriate setting : the conference center of Liberty Mutual Insurance Company. Big granite-walled office bureaucracies are the Back Bay’s money machine. People fear money machines, and no neighborhood association in the City is more feared by the various business seeking to locate, or to develop real estate. Members live in some of the City’s highest income census tracts; achievement and dominance come naturally to the 200 well-dressed Forum attendees. Attentively they regarded the twelve candidates, answering questions put to them by Tom Keane and his co-host, as if they were job-interviewing — grilling — a room full of interns. The Forum topics featured, unsurprisingly, zoning, permitting, development, the BRA, and late night closing hours — seriously complex issues all — and the banning of plastic bags. But to the questions. Some were addressed only to some of the candidates, others to all. Clearly ISD is in for a huge shake-up no matter who becomes the next Mayor. “There is overwhelming evidence that the Fire Department needs a full review and thus a Mayor who will reform the Fire department,” he said, aiming his remarks directly at Marty Walsh, whom polls show him tied with for second place in the Primary. Conley’s could have been the Forum’s big moment, but he was immediately knocked back by Charles Yancey, who said “If someone is injured within a block of a firehouse and the EMT’s can’t get there first, the Fire Department must save that life !” Mike Ross’s follow-up — “I’m the only Council member who has stood up to the Fire Department” — sounded like a shrug. All the candidates were then asked a series of “yes or no, do you support” questions. Most of these at various Forums have been no-brainers to which all answered an easy yes or a no. Not so at this Forum. candidates had to think about whether to allow later closing hours, a “traffic congestion tax,” plastic bags, and Segway. Responses were divided. Last came a round in which one candidate posed a question to one other, until all twelve candidates had either asked or answered. Obviously the intent was to have candidates emphasize their differences, but only two of the questions rose above the minutiae of Council votes little known to average voters. The first useful question was Rob Consalvo’s to Marty Walsh, who has proposed razing the current City Hall and redeveloping its huge, centrally located plaza : “How will the city function while city hall is bulldozed, as you suggest ?” Walsh’s answer was as good as Conley’s on Fire Department reform : “Bulldoze is not my word,” said Walsh. “it aas the Herald’s. I want to offer City Hall Plaza to developers for proposals. It will give us 135 million dollars and 12 million a year in tax revenue. 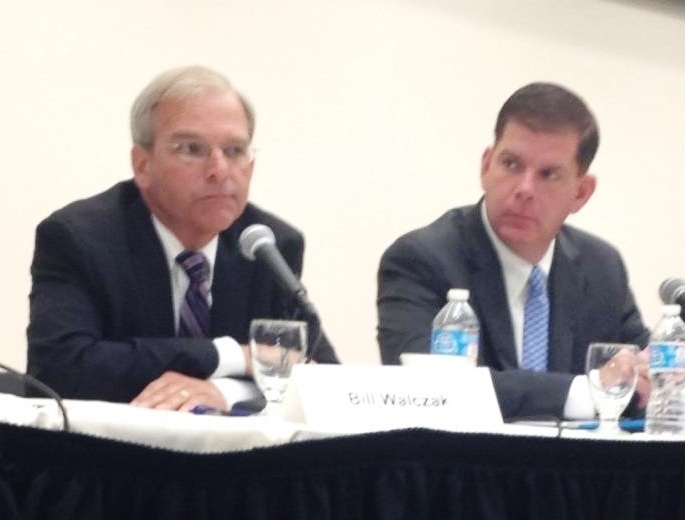 I want to reconnect Hanover steer and Quincy market…the next growth area in the City is government center !” Walsh’s answer highlighted his support by the city’s construction unions –and his being the Building Boom Candidate. Mike Ross then asked Bill Walczak what he would do for city development if the city had no casino — as Walczak endlessly repeats — but one were then created “seven feet from our door” (in Everett) ? This gave Walczak his opportunity to rail against casinos in general — “I don’t want casinos anywhere” — in the moralistic manner that he truly believes and which gives his candidacy something of the social-issue darkness that has bedeviled a great deal of the national political debate these past five years or so. Who is he — who is anyone ? — to tell people how or where to spend their money ? ^ Charlotte Golar-Richie and Mike Ross : on Ross’s home ground ? Or maybe not ? It was difficult to tell which candidates most impressed the association’s members. 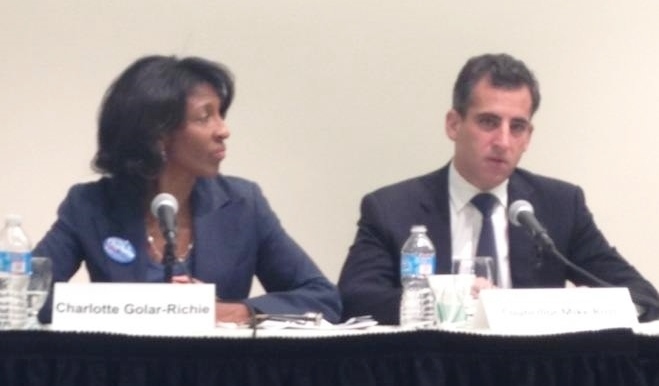 Unlike the teachers union activists at their Forum, no one cheered or clapped hands. 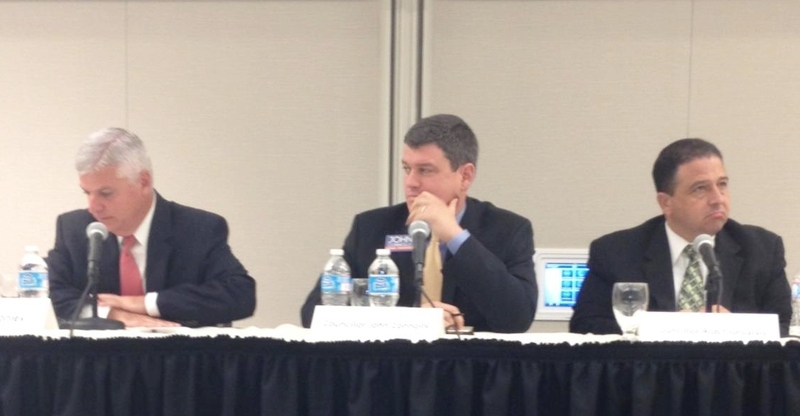 They received the candidates’ often passionate talk as calmly as candidate David Wyatt sits on a stage — though without his facial shrug. Many of the 200 worked laptops ; were they noting points ? Recording testimony as if at a deposition ? Maybe so. And who will they vote for ? This is Mike Ross’s home ground — the Council district that he represents — yet he hardly seemed the crowd favorite — although in the Forum’s humor moments, when he laughed, so did the 200. Maybe that was it. Maybe this Forum was a kind of in-group entertainment, and Mike Ross has its 200 votes in the bank. If i were he, I wouldn’t count on it.